Included in this collection are compositions and improvisations from 1957 to 2014, most of which have not previously been released on CD. These works were assembled from cassette, reel to reel, DAT and other digital recordings. These works represent my compositional and improvisational interests—all of which stray from the norm. They have been performed and recorded by jazz ensemble, voice, string, wind and percussion, and soloists—all of whom who as artists, are forward looking and who execute their art at the highest level. Since my youth I wanted to create music. I am a strong believer in education but didn’t find myself suited for it as a student or teacher. But ironically, I taught at North Texas, Denton (jazz); Berklee School, Boston (jazz); and University of Illinois, Urbana/Champaign (composition and theory) and was offered tenured teaching positions at four additional universities. During my thirty-one years of teaching, I was involved in creating music with remarkable composers and performance artists, all the while making enduring friendships with them. Some of the groups and individuals with whom I performed in these recordings are: North Texas Jazz Lab Band, Dr. Eugene Hall and Leon Breeden, directors and players Fisher “Mickey” Tull, Marvin Stamm, Billie Harper, Tom Wirtel, Archie Wheeler, Dee Barton, Claude Johnson, John Crews, John Von Ohlen, Gary Peyton and many others; University of Illinois Jazz Band, John Garvey, director with players Ron Dewar, Howie Smith, Jim McNeely, Jim Knapp, Ron Elliston, Cecile Bridgewater, Don Smith, John Monaghan, Charles Brougham, Jim Darling, Frank Harmantas, Fred Atwood and many others; UIUC Contemporary Chamber Players and Singers, William Brooks, conductor; Tone Road Ramblers with John Fonville, David Sasaki, Eric Mandat, Howie Smith, Ray Sasaki, Jim Staley, Michael Udow, Steve Butters, Ron Coulter, Dorothy Martirano, Tomeka Reid, Armand Beaudoin; Cleveland Chamber Ensemble, Edwin London, conductor. Other performers include Dan Perantoni, tuba; Zae Munn, cellist and singer; Dennis Kam, piano; Andrea Zonn, violin; David Onderdonk, guitar; Dan Anderson, bass; and Thomas Fredrickson, bass. 5 CDs, which cannot be purchased as disks but can be heard and/or purchased online. jazz from Morgan’s college days at North Texas 1957 – 1962 and Morgan’s the University of Illinois with the John Garvey bands 1967 -1969. Tone Road Ramblers compositions and improvisations. 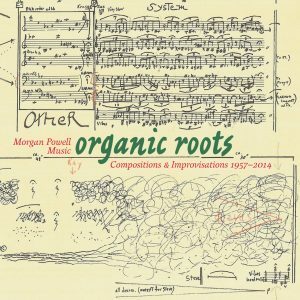 These works can be heard in there entirety at Morgan Powell Music: Organic Roots on CD Baby. These works may also be found on many of the usual sites like iTunes, Amazon, Spotify, etc.